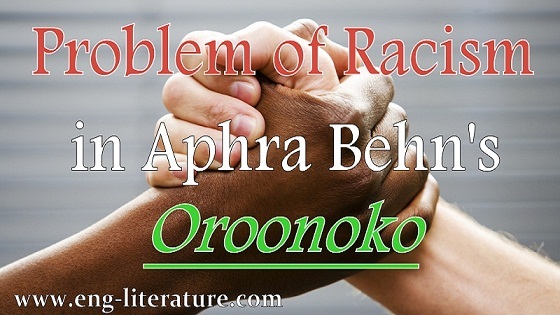 Novel Problem of Racism in Aphra Behn's Novel "Oroonoko"
Problem of Racism in Aphra Behn's Novel "Oroonoko"
Aphra Behn's Oroonoko (1688), an intensely stirring work, has captivated scholars of Restoration English literature in the last two decades with its obvious preoccupations with race, class, and gender. Behn, an underappreciated writer whose fortunes in the scholarly world are rising, is an experimenter in literary forms that attempt to characterize cultural and national identities. The setting of the novel takes place in the New World, a slave uprising in the British colony of Surinam. The story highlights an interesting aspect of the relationship between the two members of disadvantaged groups: the hero of the story, the black male slave, and the white mistress who is his narrator. Oroonoko is an example of racism in the sense of intrinsic social inequality. Oroonoko is a violent text. From the incident of arrow-in-eyeball that puts Oroonoko next in the line of succession, to Oroonoko’s final, brutal burning and dismemberment are all gruesome and horrifying. The violence is not limited to any one kind of person or people—the Africans, the Europeans, and even some of the Indian groups described by Behn’s narrator all perpetrate horrific acts of violence. Behn’s novella served an important role in the early abolitionist cause. The body is a fragile, permeable, extremely vulnerable entity in Oroonoko, subject to both physical and mental anguish. Even when Oroonoko takes matters into his own hands and kills his precious Imoinda, his body then fails him: he cannot get up and wreak his planned revenge on the whites. Instead, he languishes by her body, unable to move or leave. The relationship between the oppressed groups in Oroonoko is characterized by sympathy but complicated by the different hierarchies governing behavior. The narrator is a member of colonial society, and that is the side she takes when open conflict breaks out. Oroonoko belongs to the soldier class of a society in which women are little better than property. But within the framework of the novel it is the romantic hero, Oroonoko, who is little better than property, an aristocratic hero of epic proportions trapped in a capitalistic plot. The attitude of the narrator in Oroonoko toward slavery is not easy to pinpoint. She never criticizes slavery directly, but the perspective of the victimized hero promotes a critique of slavery nonetheless. On the one hand, the narrator insists that she has a certain amount of authority in the colonial society of Surinam, which would seem to imply participation in the racist-colonialist ideology, but on the other hand, Oroonoko is portrayed more positively than most of the colonists. It is not only the convincing details which contribute to achieving this effect; it is also the contradiction between the narrator's assumed social position and her actual powerlessness as a character within the framework of the plot. Oroonoko is the extraordinary hero of romance or tragedy, but the narrator's failure to save him, her struggle against the social apparatus, is a distinctly novelistic device. And this struggle is ultimately concerned with constraints of race and gender. In spite of too many contradictions over Behn’s fictionalization, Oroonoko is particularly interesting in the context of how literature participates in racist discourse; on the one hand, Oroonoko shows a resistance to facile racial categories, but at the same time it perpetuates categories it seems to reject. It is of particular interest to literary history that such contradictions as these are situated at the beginning of modern novelistic discourse, and that they find their expression in such a seminal work as Behn's Oroonoko.